Longtime Norwegian wargamer and fellow wargame "grognard" - Napoleon called his old campaigners "grognards"/grumblers - Fred Førde has become interested in the game and wanted to take a shot at it as Patton, and I wanted to playtest it again as the Germans to see if my collapse in the December game was just Adrian's superior playing ability or indicative of a major imbalance in the game's design. As the German, my initial setup was as in my previous, solitaire game: 3rd Parachute Regiment was down on Q6, supporting the 559th Infantrie Division's lonely regiment, holding that critical part of the Moselle River line. To enable placing a harassing dummy at C5, I put - very foolishly, as it turned out - the 17SS Panzer Grenadier Division regiment in the Foret de Haye on M5 and the other dummy as if a unit supporting it on O5. On his first turn, Fred's Patton made short work of the 37th SS PzGr Regiment, thanks to motorization being able to bring an infantry division into a heavy attack on it, with the 2nd Armored Cavalry group exposing and removing the dummy unit on O5 and moving on into N5 to cut off the 37th SS's retreat. At Q6, despite his fighterbombers not Disrupting the stronger parachute regiment and adding a combat odds shift, the German force suffered a D1 - 1-hex retreat - result, and Fred already had his bridgehead across the Moselle in the south. In both attacks, at least 1 combat command from 4th Armored Division was involved, adding a shift in the combat odds to the attacker's power. He had attacked with the 2nd French Armored division, and put its CCA out on its southern flank. I immediately attacked with 111th and 112th Panzer Brigades and the 21st PzDiv regiment at a 4:1 and rolled a 6 (B index) eliminating it! Without that SS regiment, my only unit defending Nancy itself was the 559th ID divisional unit, and Fred took the city with a frontal assault in the 2nd or 3rd turn. Fred was grumbling about how slow and difficult it was to get the corps artillery (with their slow initial movement factors of 2) into action, but when he did get them up into the fight he got a bridgehead across the Moselle in the center. By the 4th turn, he was making major gains and I was taking heavy losses, even when trying to withdraw and save units. And Fred quickly demonstrated he knows how to place/use his tank destroyer battalions, making a couple of my panzer attacks far riskier. Come the 6th turn, my only hope was for him to roll Logistical Restraint, but he instead rolled Patton Turned Loose! He had already taken Metz and all its forts as well as Thionville and one of its. Against the odds, I was holding Fort Yutz … again … and the other fort, but they were soon doomed, and he was obviously going to make his Sep-Oct victory conditions by or on Gameturn 9, so I conceded. Since it looks like Patton is certain to win if he is turned loose, the Sep-Oct victory requirement has now been moved up to Gameturn 7, if he is. Fred seemed to enjoy the game, and it would be very telling (as to play balance) to see who wins if he plays Patton and Adrian the German. Had an excellent game with Chief Playtester Adrian last night at the Oslo wargames club. I'll go into more detail later, but he opted to be Patton this time and did indeed go through the German Army - and Siegfried Line - "... like crap through a goose!" (to quote George C. Scott's Patton). As the German, I again set up that 17SS panzer grenadier regiment on M5 in the Foret de Haye, a dummy in C5, and 3rd Parachute Regiment stacked with the weak/vulnerable infantry regiment on Q6. By Gameturn 6, I had lost 17 units - HALF my army - and although he rolled Logistical Restraint, my line was so thin that all he needed to open a big hole for a major breakthrough was the one ground attack allowed during that period. As to the game's play-balance, Adrian thinks it is to Patton's advantage and that is fine by me. As Patton, a superior player like Adrian is REALLY Armed & Dangerous with the game system's compound breakthrough possibilities. I am starting to feel very satisfied with the game as it now is, so additional corrections may become few and far between. With the ex-wife and children down in Holland visiting her brother's family, I thought I'd spend part of my 66th birthday playtesting Patton's Lorraine Campaign solitaire. I was eager to try the new rule enabling a narrow corridor breakthrough past Disrupted enemy units. As the German, I set up the 17SS panzer grenadier regiment on M5 in the Foret de Haye. This also enabled me to put a dummy in C5, a la Adrian. 3rd Parachute Regiment I stacked with the weak and vulnerable infantry regiment on Q6. The U.S. thus entered the map with the usual delay in the north. 6th Armored arrived on Pont A Mousson, but did not risk a 1:1 attack across the Moselle. In the south, 4th Armored and 2nd French Armored assailed Q6 but did not get across the Moselle. Infantry and artillery entered the map and advanced to the front. Various air attacks with little real effect. In the south, the French broke across the Moselle knocking back the 21st PzDiv regt. 4th Armored only got a D result against Q6. In the center, for an afternoon attack my airpower - against the odds - Disrupted on I8 both 3PzGrDiv's 8th Regiment and FahnJunS moved there to support it, enabling 90th Infantry Division (and 737th Tank Bn) to join in the attack on 3PGD's 29thR and 462ID 552R on J7 - but only rolled a D, and the Germans held the Moselle line. Meanwhile, all was quiet on the northern front, with 5th Infantry Division holding a defensive line before Thionville and the forests. In the afternoon of the continuing Morning Fog, the U.S. finally broke across the Moselle at Q6 with the help of 4th Armored and the French continued their attack and advance north past Charmes. In the center, the USAAF again air-attacked perfectly, neutralizing the Germans on I8, but AGAIN the ground attack across the Moselle failed to make a bridgehead! The Germans now counterattacked in the south at rather low odds, having shifted their panzer brigades. 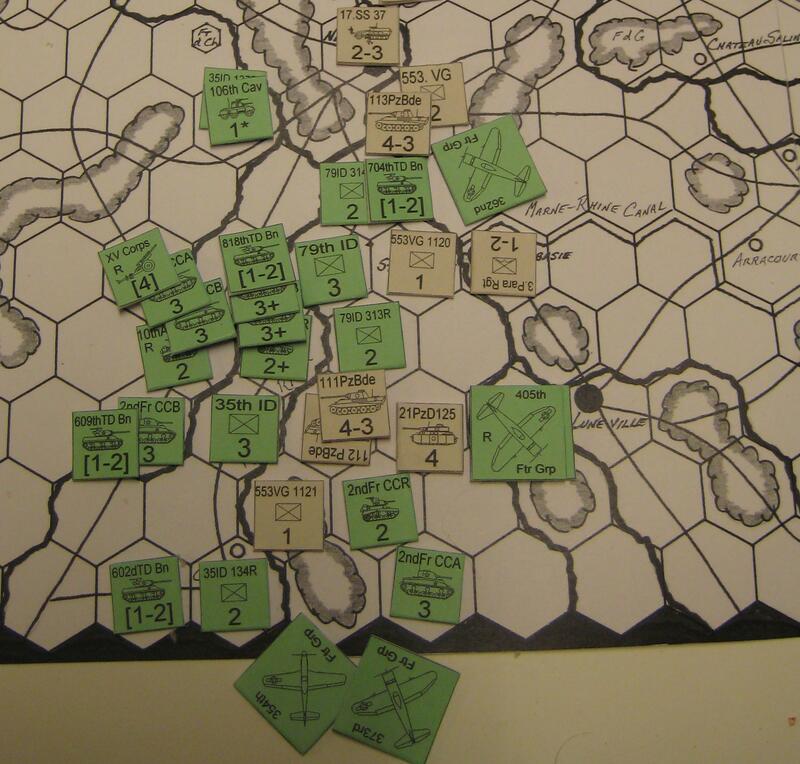 I had decided to save my airpower for my own turn, to continue my cross-Moselle assault in the center, for one thing. However, the Germans were spectacularly lucky, and 2nd French Armored's CCA and CCR were cut off! Gameturn 4, Clear: The U.S. counterattacked to save the French and try to annihilate the panzer units in the south, but to little avail. The first jpg/photo shows the German attempt to finish off the French and maybe eliminate the U.S. Moselle bridgehead at R6 held by the 313th Regiment of the 79th Infantry Division - NOTE that 111th PzBde could attack that without any obligation to attack adjacent other U.S. units, either because they (Fr 2AD CCR) were already under attack or on the other side of a river. The German attacks failed or were broken up by massed, pre-emptive Allied airpower. The 113th PzBde's fatal 1:3 diversionary attack across the Moselle to the north makes no sense, and the 362nd Fighter Group was actually re-allocated against the 21st PzDiv regt. Gameturn 5, still automatically Clear, 3rd jpg/photo: U.S. attacks to push farther across the rivers and annihilate the pocketed panzers - without airpower. 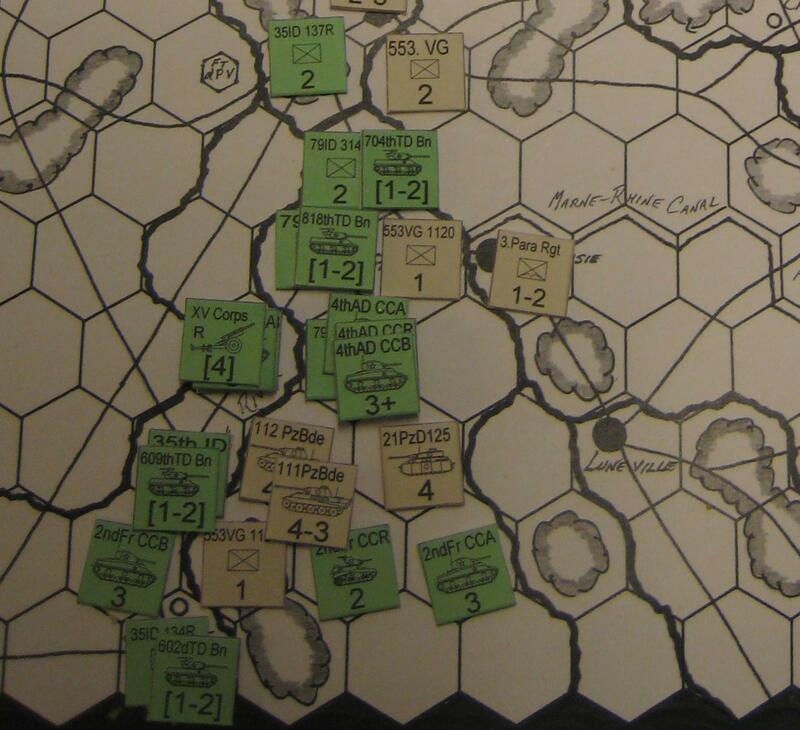 The attack on the 553VGD's 1120th Regt succeeds in pushing it back only 1 hex onto Dombasie. The attack on the 21st PzDiv regt by 4th AD's CCB and CCR and CCA/Fr2AD is 2:1 raised 2 shifts because of 4AD's inherent bonus and dropped back a shift because the French unit is out of supply. The 3:1 attack only Disrupts the German. The attack on the 2 panzer brigades by 4AD CCA, the 79th ID regiment, all that stuff including the artillery across the river, and Fr2AD's CCR similarly only Disrupts them. Finally, the massive cross-river attack on the 553VGD's regt - worth a 3, being across the river and in forest - only garners a D2, enabling that regt (now that the other German units are no longer under attack) to retreat onto the 21PD's regt! At this point, I stopped the game. With the northward retreat of the infantry regt, and the Disruption of the pocketed panzer units, the German can either try to move the parachute regiment to reopen a supply line to them or to plug the new, gaping hole along the southern edge of the battle area. On the other hand, I as Patton wasted too much strength and time in the south, when I should have avoided getting the French into trouble and focussed on my objective of getting across the rivers and striking north to surround and take Nancy. By the victory conditions, not doing so lost Patton the game ... and lost the entire campaign early on. It was the JulCon (Yule Con) mini-convention at Oslo’s Ares wargames club today/Saturday (and Sunday, but I‘ll be helping my ex-wife look after the children then, so she can finish a professional report), and Adrian and I played another game of Patton’s Lorraine Campaign. I was Patton again. Both of us were extremely sleepy. (After getting home very late after helping with the kids again, I had stayed up most of the night getting ready for the convention. Meanwhile, Adrian has been finishing his computer science masters thesis, impressively proposing computationally predicting aneurysms.) I was using Die Roll Index B, where a 6 is the best result and a 1 is the worst. Adrian again set up an upside-down/hidden piece in the little forest at C5, and although it proved to be a dummy it again delayed my northern units from getting to the Moselle. (In tribute to Adrian’s gamesmanship, the rule now states that a dummy can be no farther west than a real unit. This time, I started 4th Armored Division down in the south with the French 2nd Armored and 35th Infantry Division. Despite the 21st PzDiv’s 25th Regt being better positioned at T5, I got an immediate, expanding bridgehead across the Moselle at Q6 with 4th Armored, knocking back the 553rd VolksGrenadier Division’s little 1-strength 1120th Regiment. Adrian had obligingly started 2 of his panzer brigades stacked out on an open hex on the southern mapboard edge, and my USAAF fighter bombers immediately pounced upon and Disrupted both. (When this occurred on the second turn, we agreed he should be allowed to separate them for the sake of the playtest, and he talked about starting them on the little forest all the way back on U13 in future games. I’ll see if there is any significant forest on the original map which could be added to the U row east of Charmes, but the forest now at U6 adjacent to the 21st Panzer Division's starting hex may be sufficient.) I started no armored divisions in the center, leaving assaulting the main German Moselle defense line to operational groups consisting of infantry divisions, supporting tank battalions, and corps artillery. In the north, once it resumed moving in the second turn, I again had 6th Armored advancing (more warily, this time) on Thionville. Interestingly, Adrian advanced some of his infantry units forward from behind the Moselle River, to defend in those cursed forests north of the city, giving them the same amount of defensive bonus along with a forest‘s greater protection from air attack. With reinforcements, including a later corps artillery unit, I expanded my breakthroughs across the rivers in the south and began striking north to flank Nancy. Thanks to my fighter bombers, Adrian’s Gameturns 2-5 mandatory attacks with his panzer brigades were usually Disrupted and weakened and did little damage beyond Disrupting a unit or two of mine. This time, Adrian evacuated Nancy and saved infantry units which he would put to too good use later. Attacking all the time, I slowly worked my infantry divisions and a corps artillery unit around through Nancy, so they could assist with the northward push up through the Foret de Gremecey and its neighboring forests. At Pont A Mousson J6, I left only an infantry regiment and tank battalion defending my center. Adrian eventually attacked them … to satisfy a mandatory attack requirement, if I remember correctly … but I had units close enough to respond quickly, and that finally ended in my annihilation of the panzer grenadier regiment he had tactically advanced across the river. I was knocking back his panzer brigades in the south and penetrating past Arracourt Q11, stretching his lines and threatening a breakthrough. With so many of his units being Disrupted by air attack and my hammering infantry/artillery/tank groups and being otherwise engaged, he was having a hard time finding units available, mobile, and strong enough to get out in front of my penetration to stop it. It should be noted here that I was having even better weather luck than Adrian had had, our previous game. All the weekly turns were Clear weather, with only a few Morning Fog exceptions. His skies were dark with my fighter bombers and my luck up there was supreme, although a few groups were shot down - knocked out of the game for 2 turns - during the game. The Metz forts were again proving as troublesome as they did historically. With a division level infantry unit - the 19th German ID? - moved up to hold it, the strong Fort Driant H8 W(SW) of the city held out against 6(?) turns of 2:1 attacks, badly delaying me. Similarly, Ft. St. Quentin on the north side held out for too many turns - especially once Adrian rolled it as being restored. This was discouraging, because its western neighbor Ft. Jeanne d’Arc had fallen so early and easily, leading me to think all the forts would, in their initial, weak state of disrepair. In the north, my infantry pushed back his flank, and 10th Armored along with Combat Command A of 6th Armored eliminated and broke through the rear guard German infantry unit in the afternoon, threatening to cross an undefended northern Moselle and make a strategic breakthrough to the Siegfried Line through the therefore also undefended Orscholz Switch (fortification) Line at the strategic hex B16. Thanks to Disruptions, the only unit Adrian had available which could possibly get to that was 106th Panzer Brigade, which would have to risk 2 hexes of the most panzer-deadly air attack to get there. The 106th survived the first hex of risk UnDisrupted, and although I Disrupted it as it got into B16, it did get there. If I had rolled a lucky 6 against it in either hex, 106th PzBde would have instead been eliminated and the door opened to my armored breakthrough in the north. However, Adrian was then able to rush up additional, infantry units to take over from the 106th PzBde and stabilize his northern flank. Down east of Nancy, he also counterattacked a little flanking (and potentially isolating) breakthrough I had made with 106th Cavalry Group and an accompanying tank destroyer battalion. After D-Disrupting them in a 3:1 Morning Fog attack, he followed up with an Afternoon attack by a single 1-factor regiment. (As we remember, we think it was the otherwise entirely unformidable 1010th Security Regiment, no less.) Since the tank destroyer battalion's defense is halved against attacks containing no panzers, my defense strength was a Disrupted 2 which gave him an odds shift up from 1:2 to 1:1, which had only a 33.33% chance of retreating me and even had one 16.67% chance of Attacker Eliminated. Thus, I didn’t bother expending a fighter group to pre-emptively attack his little pest, and against the odds its attack succeeded!, forcing my units back and wrecking my little flanking ploy. Adrian was as elated as I was disgusted. Meanwhile, my artillery supported 5th Infantry Division got a bridgehead across a weakened German Moselle line up north, north of Metz and south of Thionville . I swung 10th Armored south and along with another 6th Armored combat command - because of immediate operational necessities, 6th Armored’s combat commands became widely separated on the mapboard throughout the game - and they exploited the breakthrough. However, it was Gameturn 6 and time for my 33% chance die roll as to whether I would be Turned Loose! (to consummate the pocket) ... or more probably my supplies would be cut and 3rd Army would grind to a frustrating halt at its very moment of tactical triumph. Not even for the sake of the playtest, would Adrian agree to just allowing me to be turned loose by mutual agreement - and that was fair, under the circumstances - BUT I ROLLED IT ANYWAY! I echeloned my initial/Morning and breakthrough/Afternoon attacks and rolled the dice. Despite high, air-supported odds, luck finally caught up with me on the ground, and my armor was unable to break through either in the north or even in the south, to effect the envelopment. And so, in the final “Patton Turned Loose” Gameturn 11, I had indeed taken all 3 French objectives - even eliminating Ft. Driant FINALLY, on the last turn of the game! 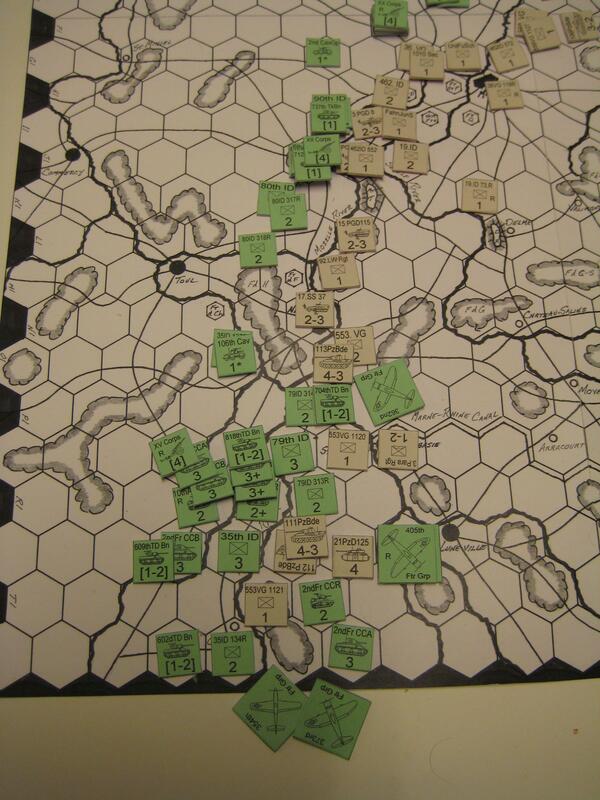 - but had no units adjacent to (let alone into/across) the Siegfried Line … and I LOST … again. During the game, I lost NO units … as the U.S. shouldn‘t, the way I have designed the game. 11 (of 50) German units were lost, including one of 21st PzDiv’s vital regiments (destroyed out in the open by airpower assisting a low-odds ground attack spotting for it), 3 panzer grenadier regiments, 2 division level infantry units, and 5 infantry regiments. Despite having begun the game (hidden) defending west of Nancy, his 3rd Parachute Regiment had survived the game and Adrian had it defying me at the strong center of his final line of defense. I have mentioned in the commentary the possibility of increasing the U.S. corps artillery units' strength from 4 to as much as 6, if the game is imbalanced against the U.S. Adrian also suggested having fighter bomber groups which have bombarded German units under ground attack stick around and assist our attacking units with an additional upward shift of the combat odds for "close air support," as Luftwaffe Fliegerkorps do in some of my Russian Front games. Although our U.S. Army Air Force P-47 and P-51 fighter bombers didn't attack enemy ground units with quite the designed precision of the Luftwaffe's (very fighter-vulnerable) Junkers Ju-87 StuKA dive bombers, they were in direct communication with our Army ground units to the extent that Cole reports them bombing, strafing, and rocketing German positions as close as 100 yards to our troops, on occasion. So Adrian's suggestion is very good and may be incorporated if needed. In any case, I really enjoyed (and enjoy) the game and greatly appreciated Adrian’s sharp-minded input about it and astute command of the German forces. If we do ever have another game of PLC, I’d like him to try being Patton, probably better showing what 3rd Army could do, but he prefers operationally defending - staving off disaster (which he certainly did in this game) and inflicting counterattack reverses. But he has a thesis to finish. During my convalescence these past few weeks ... and once I was able to sit up ... I finished designing my game Patton's Lorraine Campaign - now up and free on/via my www.CoatneyHistory.com/LorrCamp.htm which has long been on my bucket list. At least it has helped keep my mind constructively/positively occupied. Last night, I finally made it to an Ares boardgame club meeting in Oslo, and had the first (playtest) game of PLC with Adrian, a brilliant young University of Oslo computational science student who has also grilled and helped me debug my game Gazala Gallop. (Interestingly, he and Fred Forde really like my recently republished game Sturm nach Osten (I Shturmy na 3apad! ), which I find too complex to enjoy anymore.) Adrian is as sharp as (my older son) Robert, who helped me playtest so many of my webpage games back home. I was Patton(! :-) ), and Adrian (who likes to be the counterpunching defender) was General Blaskowitz - later General Balck. Like Frank Chadwick, I design games to play them, but I usually lose them - even if I am the designer. It started off badly. In addition to all the other German units back holding the Moselle River line, they have a strong, 2-3 SS panzer grenadier regiment and a parachute regiment they can place anywhere upside down, along with 2 dummy units to confuse where those might be. Adrian positioned one of the upside down pieces in a forest astride an important road junction, right out in front of my units in the north. Figuring this was just an Adrian bluff/psychological warfare ploy, I ran my fast but weak (1-strength) 2nd Cavalry (reconnaissance) Group right out to attack it ... and it was the SS PG regt! My Cav Gp vaporized in what turned out to be its 1:4 attack, and then I had to expend/waste a couple turns (delaying my advance to the Moselle in the north) eliminating the SS. In the far south (of Nancy, France), things went much better, if only due to the too-vulnerable positioning of the German units down there (which has since been revised/corrected in the game.) I soon had a breakthrough developing across the Moselle and threatening a surrounding of Nancy. Meanwhile, various infantry divisions supported by corps artillery as it arrived on the board, along with the elite 4th Armored Division, began pounding a bridgehead across the very heavily defended Moselle line in the center. In the north, Adrian left the topmost row of hexes unguarded, and to his alarm I sent 6th Armored's Combat Commands A, B, and R through it to threaten strategically flanking him. He rushed up 106th Panzer Brigade and with local infantry units, Disrupted CCA. Meanwhile, in the center, I got my bridgehead across the Moselle and took the formidable Fort Driant to objective city Metz's southeast but diverted many of the forces south to join in the surrounding and besieging of the German units in Nancy. From my southern breakthrough, I actually advanced a principal infantry division unit up to the east of Nancy, but Adrian had enough units to counterattack it with a panzer brigade and accompanying infantry. (In Gameturns 2-5, the Germans must make at least 1 (Hitler-ordered) attack, even against the odds, but Adrian needs no such incentive to counterattack, effectively, anyway.) Thanks to an accompanying tank destroyer battalion, my isolated units survived the attack and then helped reverse the situation and enable another - and what proved to be final, successful - attack on the city and eliminate the German infantry and parachute units therein. However, the ever-vigilant Adrian pointed out my rule that if one of the 3 French objective cities was isolated or taken, he could bring in the 11th Panzer Division kampfgruppe (battlegroup), which he did IN THE NORTH against 6th Armored! DISASTER. CCA, CCR, and an accompanying tank battalion were lost, and my penetration erased. We arrived at the 6th turn, and I (as Patton) had a 1/3 chance of there being no historical cutoff of supplies (which were historically diverted to Montgomery and the British for the disastrous parachute drop in Holland - see the film A Bridge Too Far.) If we had both agreed, I could have gotten the "Turn Patton Loose!" option, but Adrian didn't want that to happen. The "Logistical Restraint," slowing me down and reducing my attacks, would enable more French forts to be restored/strengthened against me, delay of my resumed offensive until much worse November/December weather, and a general stabilization of his line of defense. And indeed when I rolled the die I did not get "turned loose," it was starting to get late, and we decided to end the game. I agreed with Adrian that although I hadn't yet lost, that would probably occur at the end of the normal game, considering my loss of those 6th Armored combat commands.